Great news coffee fans! 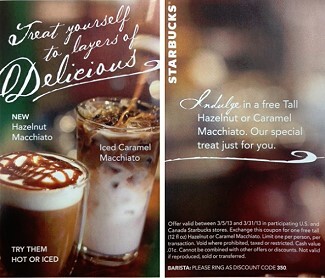 Starbucks is giving away FREE Hazelnut or Caramel Macchiato (tall size only). Apparently, there are coupons near the register. If you can’t find them – just ASK the cashier. They will honor it. You can try them hot or iced. You have to love a sentence that has the two words FREE and STARBUCKS. Hi, my local Starbucks looked at me as if I was crazy when I asked them about the free promo. Each store only had a limited amount of paper coupons that you needed to redeem. This is a scan of that paper coupon–if you don’t have one, you can’t get it.